The Vokh are a bunch of bastards, there’s no way around that, and if Lt. Kai Tana has any say in the matter, their plans to rule the universe will be… thwarted. With authority. That said, her action platforming adventures do date back several years at the time of writing, and I doubt the exclusive content in this upcoming retail version of Velocity 2X will provide her with any actual benefits. So… what good is it then, and to who? Well, let me tell ya! First and foremost, I’d say ‘to collectors’, and ‘because exclusive content’, which does actually include some pretty interesting stuff. Provided you enjoy watching making-of documentaries that is. If not, there’s always some physical goods, including a booklet, “focusing on the inspirations behind the creation of the game”. And again, considering the game has been available for both PlayStation 4 and Vita for several years now, this release is… pretty much for the fans. As such, the exclusives are certainly spot-on, I’d say. They’ve created an armada by enslaving other races and seek to make humanity their next conquest. Kai Tana must free the enslaved races and use her Quarp Jet to stop the Vokh before they can discover its secrets and invade Earth. You do also get a copy of the lovely soundtrack, and not some digital code for a download either. Nope. This is the real deal: a compact disc! Wait, are those things even around anymore? I guess they must be. If not, then UK-based FuturLab (developer) and BadLand Games (publisher) certainly went above and beyond to make that happen. Right. Anyway, also featured in the Critical Mass Edition is, well, both expansions (Critical Urgency and Dual Core); you know, for when you’re done blasting Vokh in the main story, every last collectible and achievement trophy acquired, and so on. All in all a pretty nice looking retail release of an already popular game, no doubt, and if it ever hits PC… I’ll be grabbing a copy day one (ya listening, FuturLab?). 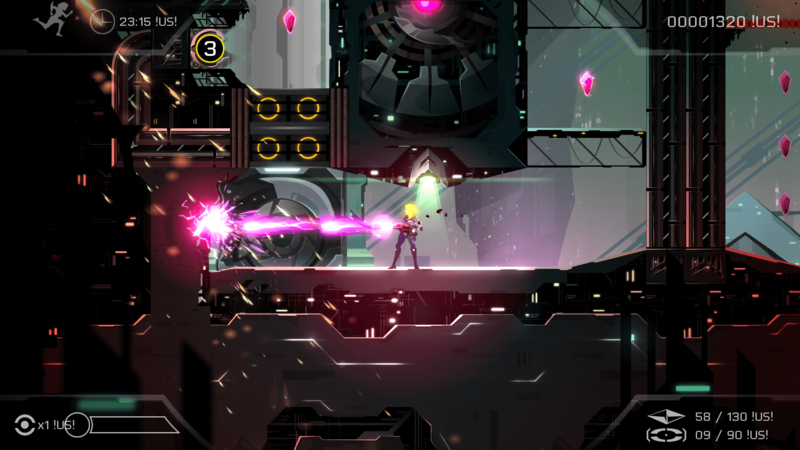 As for Velocity 2X: Critical Mass Edition‘s upcoming PS4 and Vita releases – we can expect those to hit store shelves on August 25th for EU, October 3rd for US. Oh, and if you feel like pre-ordering, here’s a list of stores. Just in case.